what do you do when you lost your driver license or driving with expired tax in Phuket ,we have the answer. As long as your paperwork is in order, the rest of the process is all about queueing up and waiting your turn to pay the fee. Vehicles older than 7 years must undergo a safety inspection at a licensed mechanic, several of which can be found near the PLTO. Many people forget to renew their car tax certificate which requires mandatory insurance and an annual payment, in addition to any overdue fines. Last Sunday, I lost my wallet, along with my Thai driver’s license (five year type and still two years to go before expiration). I think I may have dropped it at a Supercheap convenience store in Sapam. How can I report it to authorities in case someone finds it? Also, if I don’t find it, will I have to take the exams all over again to get a new license? One more thing, my car tax expired ages ago, can you advise me on how to renew this, and if I will have to pay any fines? Dear Larry, Thanks for all your questions. 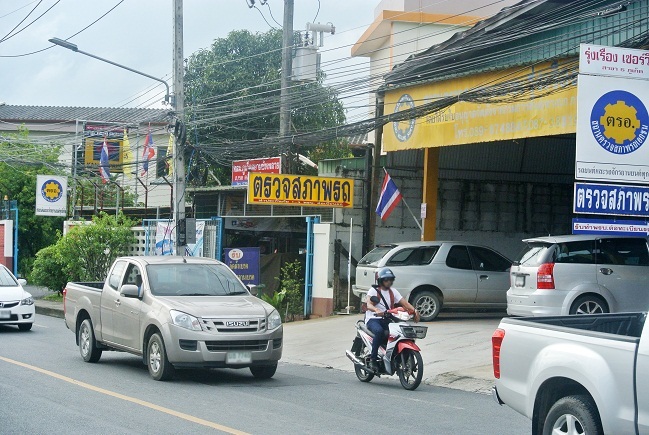 We are very familiar with the challenges and processes of obtaining and maintaining street legality in Phuket, and happy to shed some light on the matter for you and everyone else. To obtain a replacement Thai driving (or driver’s for Americans) license, you won’t need to do the driving test again (unless your license was expired) but you do need obtain a police report no older than 7 days at the time of application, and a new proof of residency document from immigration. While you can file the report at any police station, you should try to file it at a police station nearest to where you think you lost your wallet. The closest police station to Sapam that we know about is Mueang Police Station (geo coordinates: 7.891877, 98.387428) Just walk in and tell one of the idle police officers you want to file a report that you lost your wallet. An officer will ask your name, and for identification (your passport). He may not ask you specific details, so be sure to slowly and clearly volunteer any information you can (what you lost, where and when). When the officer is finished filling out the form, they will ask you to sign it and pay B20. This is the standard police report filing fee in Thailand. As for ‘Lost and Found’ channels, it is not likely that you will see your wallet again in the event it was stolen. But if you think you dropped it in or at the Supercheap, you can request to view their CCTV footage during the time you were there. They keep their CCTV logged online for a certain period of time. Once you have the police report, which will be in Thai language, then you also need to obtain a proof of residency document from Immigration (7.869823, 98.394031). You must obtain a new one and can not use an old one. 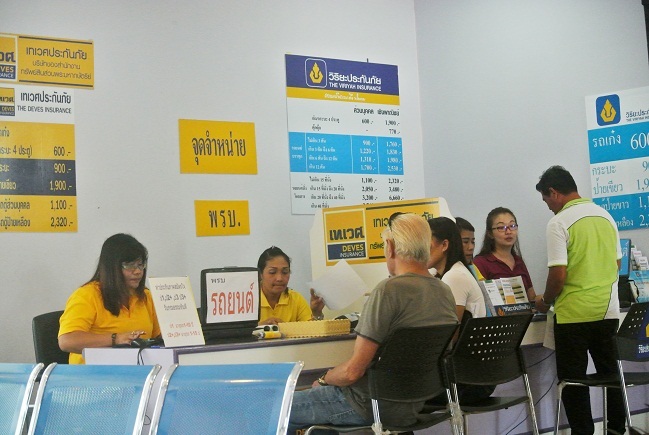 Next, head to the Phuket Land Transport Office (7.870800, 98.389445), making sure to bring your passport, along with the proof of residency paper and police report. Note that Thai nationals only need a copy of their ID and can file a report of lost license directly at the PLTO. You will have to wait in a few lines, and eventually it will come your turn to pay the filing fee (B100), take a new picture, and pay for the replacement driver’s license (B105 for 5-year class), which will be printed immediately and still expire on the original date it was due to expire on record. Regarding expired car tax, yes you can renew your tax certificate (the sticker that you post on your wind shield) at the PLTO, but at the registrar building on the east side of the compound. You need several things: the ownership book with your name on it, either the real one or a copy of the page with your name as owner or person in possession of the vehicle. If your name is not in the book, you may not be allowed to renew the tax certificate. You will also need a valid “PorRorBor” certificate showing you paid the mandatory motorist insurance required for every motorist. If you don’t have this, you can obtain a new one quickly at the PLTO. It should be about B900. Also, if your vehicle is more than 7 years old, you will need to a certificate from a PLTO licensed mechanic verifying that your vehicle is safe for the road. You can obtain that from a few garages located nearby (7.872320, 98.389922), which will take about 20 minutes to complete and cost about B200. The vehicle tax is annual, and will depend on the weight of your vehicle. It can be anywhere from B300 (less than 500kg) to B4,050 (more than 7 tonnes) per year. There is a small fine for paying outstanding back taxes, but it should only be a few hundred baht per year for most cars. Are special motorbike licence plates legal? Are businesses in Phuket national parks legal? 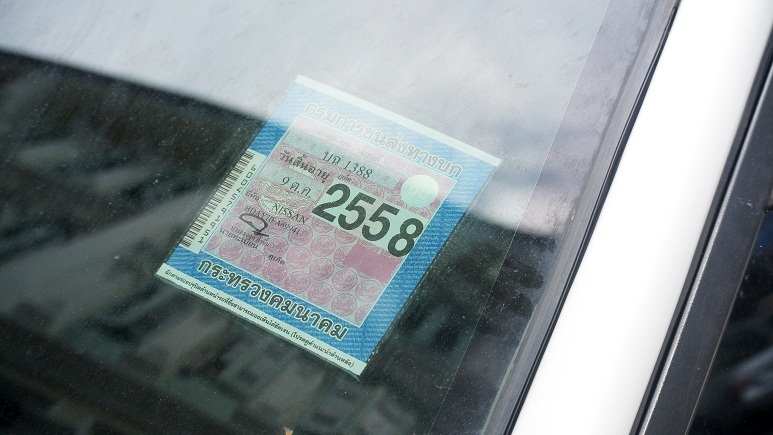 Is blurring licence plates on tourist buses, vans and taxis legal in Phuket? Which heavy vehicles are banned from travelling over Patong Hill? How do I know whether gold I buy in Phuket is real? Is the Phuket Airport bus still running to Patong?